Transitional Intentional Interim Ministry Specialists converge annually at the Gathering for fellowship, a keynote, workshops, business and a banquet. The 2018 Gathering will be in Des Moines, Iowa. 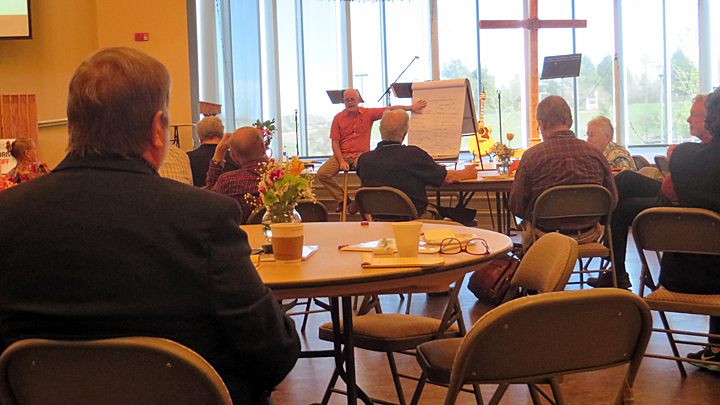 A group of United Methodist pastors have worked diligently since 1997 to recognize and encourage the specialized task of interim ministry. From their work came the Transitional Intentional Interim Ministry Specialists Association of The United Methodist Church or TIIMSA that is responsible for the ongoing development, training and support of intentional interim ministers. Transitional Intentional Interim Ministry Specialists (TIIMS) offer an alternative to what had been the usual practice when a United Methodist church lost a pastor to death, illness, misconduct, chronic conflict, retirement following a long pastorate, or some other circumstance. The bishop would immediately appoint a new pastor leaving the local church with no time to grieve the pain of their loss or to prepare for a new vision with a new person. The hurting congregation and anxious new pastor just had to make it work. Today these experienced TIIMS are available as trained specialists in dealing with transitions. They are appointed to assist a wounded congregation through an intentional time of healing and wilderness wandering as they come to terms with their current situation and prepare for new leader-ship. It is similar to the Biblical Moses who brings God’s people out of crisis towards a promised land of milk and honey, including a new leader, Joshua. So, for many TIIMS serving in United Methodist churches, the walking stick, such as the one used by Moses, has become a symbol of their specialized work. Like a person leading hikers through rugged terrain, it is helpful to have a staff to keep one’s balance, maneuver past obstacles, and reduce the stress in the ups and downs of the journey. The interim pastor will often place this symbol of transitional ministry on the church’s altar during their time there to represent their intentional journey with that congregation in preparing for a new stage in their history. Experience has proven during such transition periods that the guidance of a person trained to be a calm presence can assist a congregation to manage conflicts that otherwise would have been passed on unresolved to a new pastor. Phase I is a four-day intensive orientation to the work of intentional interim ministry. Phase II is a five-month period working in a current appointment, applying the learnings gained in the first phase along with mentoring by the Phase I leaders. The training concludes with a three-day Phase III gathering to integrate Phase I learnings with the Phase II experiences. Each year TIIMSA credentialed lead trainers offer these seminars in various settings around the country hosted by annual conferences (e.g., Texas or Rocky Mountain), or an organization, such as the Des Moines Pastoral Counseling Center or the Intentional Growth Center of Lake Junaluska. Accreditation for the certification process is with the General Board of Higher Education and Ministry’s United Methodist Endorsing Agency. Scheduled training seminars can be found at https://tiimsa.org/training/, http://dmpcc.org/interim/, and http://www.lakejunaluska.com/events/clergy_leadership/interim_ministry_training/. CALLED TO A NEW MINISTRY PATH? Many pastors seek TIIMS training because they feel called to this new career path or because they have retired from full-time itineracy and find contributing their veteran skills and experience in this specialized and focused ministry to be very rewarding. More than 600 United Methodist pastors have been introduced to intentional interim ministry through the training and more are needed as annual conferences recognize that a church’s health can be enhanced during the short-term critical transition period of pastoral change through a discernment process that prepares them for a new pastor and a renewed future. Whether the transition was unexpected or anticipated, the goal of the interim appointment is always to assist the congregation to grow in health and mission. Following the interim, a congregation is ready to greet their new pastor and move into the next stage of their history. With the average length of pastoral appointments growing longer in The United Methodist Church, there is a new need for clergy to find renewal using short-term study leaves and longer-term sabbaticals, returning to their congregations with improved vigor and inspiration. An experienced elder trained as a TIIMS can bring a sense of stabilization and guidance to the congregation during their pastor’s absence. TIIMS have also been used in situations where clergy are temporarily deployed as military chaplains. The focus of all intentional interim appointments is the needs of the local church, approached with creativity and flexibility. “3. Interim appointments may be made to charges that have special transitional needs. a) Interim clergy may serve outside the annual conference where membership is held under the provision of ¶ 346.1, with approval and consent of the bishops involved. The people of God sometimes need a Moses with a walking stick of specialized training to lead them on their journey toward the promised land!